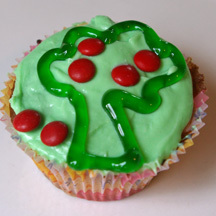 Arbor Day is coming up (in 2009 it’s April 24), and after you plant a tree you can plant an apple tree cupcake in your belly. 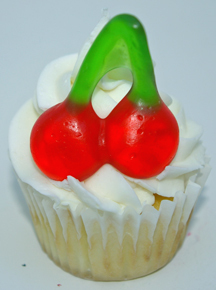 Also great for Earth Day, Johnny Appleseed celebrations or anytime, these cupcakes are easy and fun. How to Make It: Frost cupcake. Draw tree shape using gel icing. Add upside-down M&Ms for apples on the tree and ground. 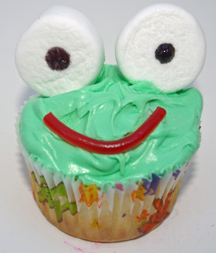 Get hopping for Leap Day or any day with these fun frog cupcakes that use marshmallows for buggy eyes. What You Need: 1 cupcake; icing tinted green; 1 marshmallow; black gel or writing icing; red licorice; scissors. How to Make It: Frost cupcake. Use kitchen shears or floured scissors to cut marshmallow in half widthwide Use black to make 2 eyeball dots on the not-sticky end of the marshmallow halves. Set eyeballs on cupcake. Add red licorice mouth. It only comes around every four years: It’s Leap Day, February 29th, and 2008 is the year for it. 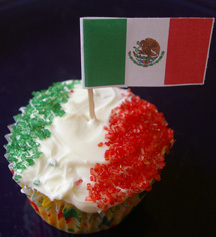 If you’re reading this later, you don’t have to wait until the next leap year in 2012 to enjoy these fun frog cupcakes. They’re hoppin’ good for any occasion. What You Need: 1 cupcake; white frosting; green fondant; circle cutter; gummy frog; candy flower (or piped icing flower). How to Make It: Frost cupcake. Roll out fondant (see our cupcakes and fondant page for tips) and cut out circle. Then cut triangle-shaped notch out of circle so it looks like a lilypad. 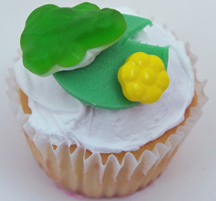 Use dabs of icing to stick gummy frog and flower to lily pad. 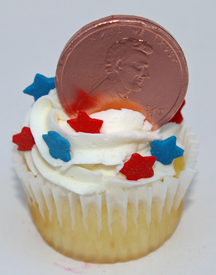 Celebrate President’s Day by reliving the “George Washington chopped down the cherry tree” legend in cupcake form. What You Need: 1 cupcake (baked and cooled); white frosting; 1 slim stick pretzel; bit of purple or other dark fruit leather (we used Stackers); cherry sour candy; scissors. How to Make It: Frost cupcake. Use scissors to cut ax head shape from fruit roll or snack. 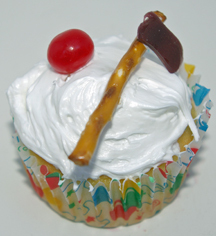 Use dab of icing to stick ax head to pretzel and place on cupcake. Add red cherry candy.